This porridge is one of my all-time favorite things to eat for breakfast! I’ve talked about my love of sweet brown rice before. It is a starchy, short-grain rice that makes puddings and porridges deliciously creamy. The creamy sweet brown rice combined with protein-rich quinoa, maple syrup, coconut oil, cinnamon, almond milk, topped with crunchy toasted pecans and coconut flakes is my idea of breakfast heaven! One great thing about this porridge is that it reheats perfectly, so you can make it ahead of time and keep it in the refrigerator. Just keep the toasted pecans/coconut flakes in a separate bag at room temperature. Scoop out and reheat individual servings of the porridge as desired for an easy on-to-go breakfast! I have always preferred hot cereal to cold. This porridge rivals my love of oatmeal, which is saying a lot! Sometimes I think about the irony that I loved Cream of Wheat growing up. It is now known at my house as Cream of Death. But with oatmeal, this delicious hot cereal, and this porridge my hot cereal cravings are always satisfied! For this cereal, I like to soak the rice and quinoa overnight before cooking. I find this makes the porridge extra delicious by completely gettting rid of the grassy taste quinoa somtimes has. I also think this brand of quiona is the least grassy-tasting of any I’ve tried. Soaking grains is a traditional way to prepare them that makes their nutrients more bioavailable and reduces phytic acid, which can be hard to digest. A win-win right? The night before, place the sweet brown rice in a bowl and cover with water. Rinse the quinoa, place it in another bowl, and cover with water. Cover both of the bowls and let sit at room temperature overnight, or up to 24 hours (changing the water every 12 hours). Soaking makes the grains easier to digest and their nutrients more bioavailble. I find soaking also completely gets rid of the grassy taste quinoa can sometimes have. If you forget to soak them, simply rinse the grains well and add 5-10 minutes to the cooking time. In a medium saucepan, bring the water and salt to a boil. Meanwhile, drain and rinse the grains. Add the rice and quiona to the water and bring to a boil. Reduce to a simmer, cover, and cook on low heat for 50 minutes. While the grains are cooking, place the pecans and coconut flakes in a dry skillet over medium-low heat. Toast the mixture, stirring occasionally, until golden, about 5-7 minutes. When the grains are done cooking, stir in the coconut oil, maple syrup, cinnamon, vanilla, and almond milk. Serve a large spoonful of the porridge topped with some of the toasted pecans and coconut flakes, additional almond milk, more maple syrup if desired. Enjoy! 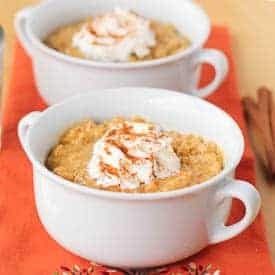 *This porridge reheats great, so you can make it ahead of time and keep it in the refrigerator. Just keep the toasted pecans/coconut flakes in a separate bag at room temperature. Scoop out and reheat individual servings of the porridge as desired. You are a lifesaver. I can no longer eat oatmeal as much as I used to, and have been dyyyyyying for some hot cereal in the morning (especially given the weather). This looks just perfect. This is the first time I visited your site; was checking for healthy gluten free warm breakfast ideas for my husband. 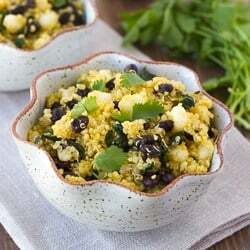 This sounds really nice, but I don’t think I’d add the quinoa so early to cook that long. I generally only cook it about 12 – 15 min. so will probably add it during the last 15 minutes. I always wash quinoa well and strain it but hadn’t soaked it for cooking. I did sprout it a couple times but since my husband likes warm breakfast in the winter, have been cooking it. Will soak it next time as I’m sure it will be a good thing to do. I enjoy a green smoothie or fresh veggies for breakfast as they’re quick. I’m anxious to check out your other recipes as soon as I get a little more spare time. I did notice your sloppy joe buns. We don’t have them often, so usually make the buns, but don’t always have time. We don’t have Whole Foods or any or the other big stores here but do have a Wegman’s. Are they frozen or in the fresh section? Hi Ann! Thanks for stopping by my site. The buns can be found in either place, but many stores carry them in the freezer section. It depends on the store. For the quinoa in this porridge I actually like how it gets well cooked into the brown rice. I think opening the sweet brown rice during cooking to add the quinoa part way through might disrupt the rice cooking. I hope this helps! Thanks for the quick response. I hadn’t thought about disrupting the rice cooking cycle, so glad I asked. 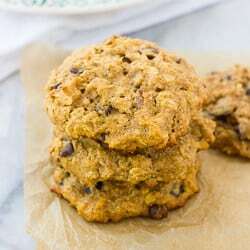 I did spend some time checking out your recipes and found a few that sound great. I make everything from scratch and eat fresh veggies, as I don’t buy processed foods. I remember the ‘old days’ when most of the food wasn’t so contaminated and we didn’t have to be so careful. I’ll be anxious to try this recipe and feel certain my husband will like it. He does get tired of plain quinoa, and gluten free oatmeal. I fix him eggs frequently but likes toast with them, so I make gf biscuits. I’m still looking for a good bread recipe and will check Wegman’s for those buns. I am SO making this for breakfast on the weekend!!!! Looks amazing.